The easy thing of this pattern is in the way the knots are made. 20 Repeats of the pattern is about 12,5 cm (5 inch) long. 1. Start with placing the threads in the order as shown in the upper part of the picture. So, from left to right: gray, red, gray, red, gray, red. 2. Start at the rigth side with 2 double left knots with red around the gray and red thread. 3. Then at the left side make 3 double right knots with gray around the red, gray and red thread. 4. Then again at the left side make 2 double right knots with red around the gray and red thread. 5. 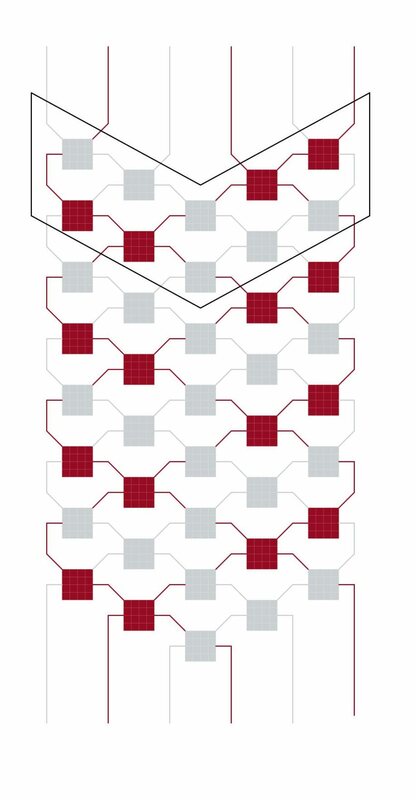 Return to the right side and make 3 double left knots with gray around the red, gray and red thread. 6. Then again at the right side make 2 double left knots with red around the gray and red thread. 7. Repeat steps 3 to 6 until the desired length.